In Time effectively introduced a whole new aspect of Technological Advancement that does not need any robotics at all. I really loved the premise and the concept of the film. I commend the Director and the Writer for bringing a whole new flavor of the future by introducing Time as an essential element and substitute for money and status symbol. 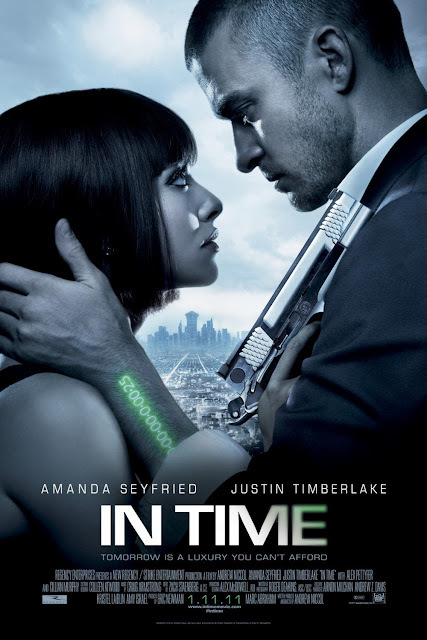 This film may lack a sort of impact and may not be your high-octane film but “In Time” delivers its thrill and excitement through its creative, stylish and original plot that will glue you until the end. It may not be as profound as other films, but this movie gives you a great ride of saving your time by all means. Upon watching this film, you’ll learn to give importance to every minute of your time and be able to make the most out of it for your loved ones. What this film lacks is its profundity in terms of storytelling and plot scheme. The movie did not fully contain a good background on the whole concept of TIME. The film must focus their premise on the Company that started the whole thing. The plot lacks the exposition of such Company and how they were able to steal time all over the world. The timekeepers were not also given much emphasis on their roles in the film. With enough background and in-depth approach, the film would be better as it should be in terms of execution. But nevertheless, In Time still delivers its whole new concept. Cinematography-wise, the film is good and smooth. Production may not be as impressive as it should be, but the concept of different Time Zones make this film distinct. You could really identify the status symbol of every individual through the Time Zone she or he is in. And with this concept, the film effectively delivered at an average note. Justine and Amanda were also good in the film but not exceptional. I see their Chemistry and charm together. I must say this one of the greatest film of Justine and Amanda to date. Although Justine lacks emotion at some point, he was able justify his role until the end. Amanda, on the other side, is as beautiful as her portrayal in the movie. It is a good popcorn movie that will literally ratify the saying that “TIME IS GOLD”.